The speedy way to learn! Zoom through cool games with McQueen and his pals to explore opposites, colours, shapes and numbers. 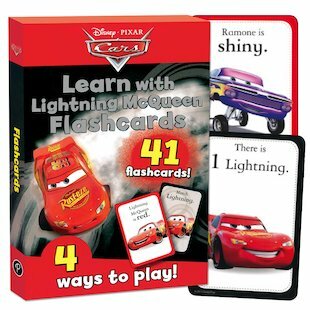 Packed with snappy images of the Pixar movie characters, these colourful flashcards introduce an array of essential skills in a way that will prove irresistible to any car-obsessed little boy. With 41 cards allowing four exciting ways to play, each focusing on a different learning area, they’re the perfect way to master all the things a quick little learner needs to know! These cards have been developed with the support of an educational consultant, and are ideal for young children who are mastering first words and concepts.